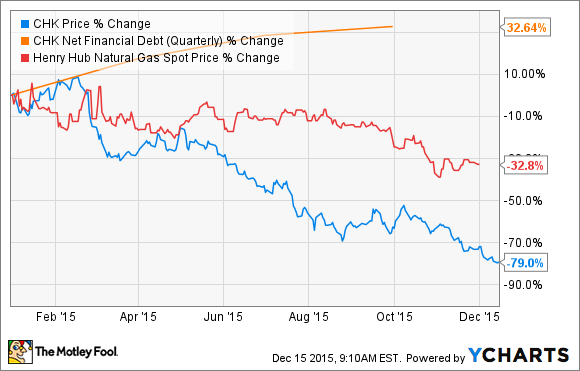 The nation’s second largest natural gas producers has hired a restructuring advisor to help address its debt problem. What a difference a year makes. A little over a year ago Chesapeake Energy (NYSE:CHK) CFO Nick Dell'Osso told investors that "Chesapeake has never been stronger financially." That strength was in large part due to the sale of a huge swath of the company's acreage in the Marcellus and Utica shale plays to Southwestern Energy (NYSE:SWN) for roughly $5 billion in cash. Chesapeake Energy's problems in 2015 really started when it announced that it was reverting back to its old ways of outspending its cash flow. This was after it decided to use some of the cash it received from Southwestern Energy to grow its production 3% to 5% this year. It was a move widely panned by analysts with many downgrading the stock after the announcement. Chesapeake did quickly realize that this wasn't the best idea, and a month later it lopped off a half a billion dollars from its $4 billion to $4.5 billion budget, which tamed production growth to just 1% to 3%. However, due to improving well performance and lower than expected capital costs throughout the year the company continued to boost its production growth outlook -- with its adjusted production now expected to be 6% to 8% higher than last year -- while only trimming another $100 million of its capex budget. Normally, this would have been a great achievement, but the market simply didn't need any more oil or gas with it so vastly oversupplied that the excess is filling up storage capacity. That said, Chesapeake Energy isn't completely to blame for the weak gas prices because it wasn't the only producer driving robust production growth into an oversaturated market. Southwestern Energy, for example, is expecting to grow its production 27% this year, which after a couple of revisions and some assets sales will result in a higher average rate than its initial guidance. The difference is that Chesapeake grew production to its own detriment this year, which has really limited its options going forward. The company has reportedly hired Evercore to help it address its growing debt burden. This was something that Chesapeake has been trying to creatively address, with the company recently announcing a private debt exchange offer. It was offering up to $1.5 billion of senior secured second lien notes in exchange for some of its unsecured notes, with a preference toward near-term maturities. However, with roughly $11.6 billion in outstanding debt the company needs to do more to relieve the growing pressure on its balance sheet. This is where Evercore would come into play because it could help the company reorganize that debt, possibly arranging the exchange of its existing bonds at a discount for new debt or equity securities, or exploring assets sales.